Caramel is Pam McKinstry's (of SVKitchen.com) favorite thing, especially combined with chocolate, but she likes it unadulterated, too, in all of its many forms. Dulce de leche, Spanish for “sweet milk,” is on her list of must-have condiments. Pam always has a jar or two in her over-crowded fridge because it’s very versatile and great for last-minute desserts. Sometimes she'll treat herself with a spoonful right from the jar if there's nothing else on hand to satisfy a sudden caramel craving. Gourmet specialty shops generally stock dulce de leche (it's fairly trendy these days), but it tends to be expensive. Ethnic markets also sell canned dulce de leche, but Pam finds this product exceptionally flat tasting, lacking the depth of flavor and intensity of high-end products. Pam's long made her own version, having learned the trick while working in safari camp kitchens in Zambia. They used the dulce de leche to create a concoction called Banoffee Pie, which alternates caramel with layers of Marie biscuits, sliced bananas, and whipped cream. 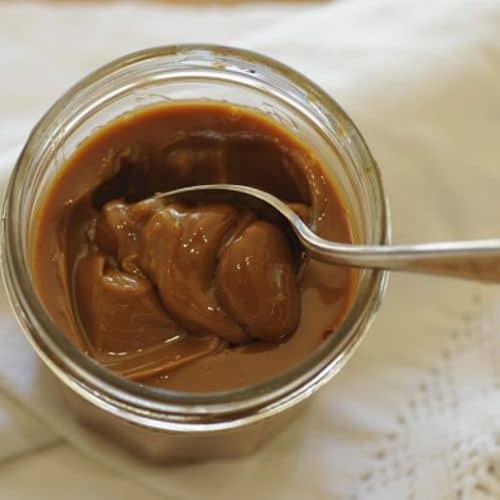 Pam says that making your own dulce de leche will not only save you money, but your sauce will be superior in taste and quality. And it’s so very simple! The slow, even heat of the sous vide machine is perfect for caramelizing the milk, and eliminates the possibility of scorching. The milk slowly transforms into a thick and luscious dessert sauce. She's specified making the dulce de leche in glass jars (canning jars are perfect), but some people might make it in the original condensed milk packaging (remove the labels first). Beware, however: tin cans are coated with a protective liner that contains bisphenol A (BPA). Although the EPA reports that human exposure to BPA from can coatings is minimal and poses no known health risk, some consumers find it a concern. Also, some condensed milk brands warn not to heat the cans, so why take a chance? Dulce de leche makes a perfect hostess or holiday gift, so think about filling your machine with 6 or more jars when you make this recipe. For a quick dessert, mix dulce de leche with crème fraîche and use it as a dip for strawberries. If you would like more information about the modernist techniques, ingredients, and equipment used in the Sous Vide Dulce de Leche you can check out the following. If desired, open the cans and transfer the condensed milk to sterilized 1/2-pint glass jars, leaving a 1/4 inch head space, and seal with tight-fitting lids. Alternately, remove the labels from the cans and leave them sealed. PT13H 1 &frac13; cups per can Ingredients: 3 14-ounce cans sweetened condensed milk. You can cook more if you wish. Sous vide dulce de leche is a very convenient and quick to make treat.